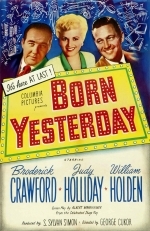 This week's movie is Born Yesterday (1950) starring Judy Holliday, William Holden, and Broderick Crawford. Not rated. 1h 43min.